Images open in new window. 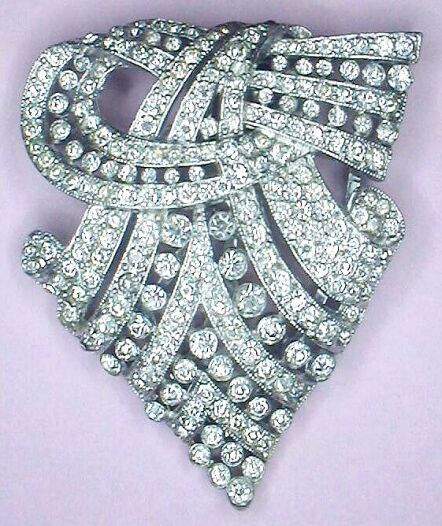 Completely pavé in clear rhinestones, the undulating rhodium-finished Trifari Deco Dress Clip has a Patent #107142, of Date: Nov 23, 1937, and description: Item: Clip, Owner: Trifari, Krussman & Fishel Inc., Inventor: Philippe, Alfred. The back is marked Des. Pat. No. and 107142. It is not marked Trifari or TKF [or KTF] as later Trifari production was. The original design sketch can be seen online courtesy Jewelry Patents, scroll down to 107,142 sketch. Very good vintage condition with all stones present. A few have darkened but overall the stones are excellent. 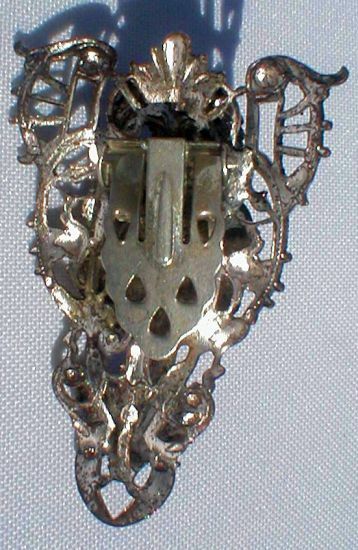 Rhodium finish is in excellent condition on both sides of the clip. The clip mechanism is tight. 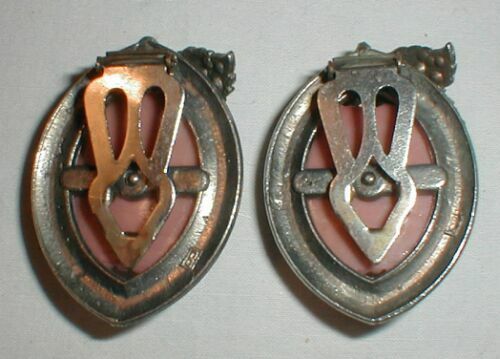 The view side of the clip mechanism is a duller finish than the back of same as shown in the image above. 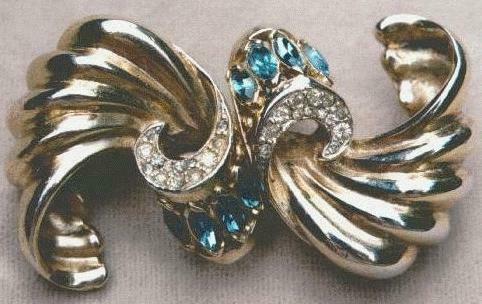 Goldplated cast, deep aquamarine color marquis and pavé rhinestones. Finish and stones are all excellent. Shaded areas in photo are sun glare reflections. 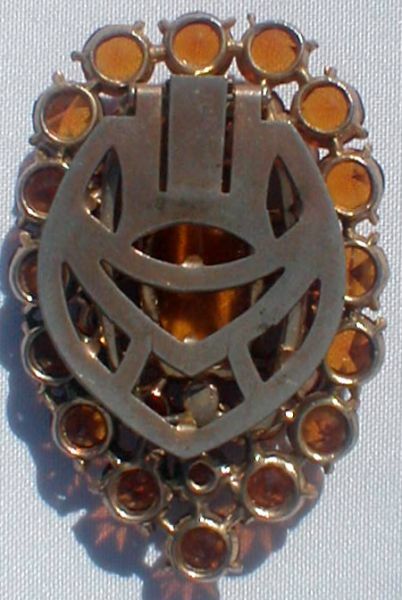 Marked Coro with Pegasus mark (the horse). 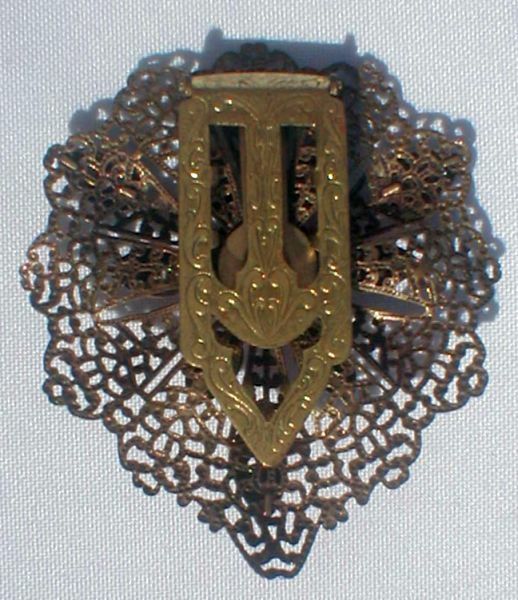 Marked Coro Duette in script and Patent Number on joining clip PAT No. 1798867 [Patent registered in 1931]. 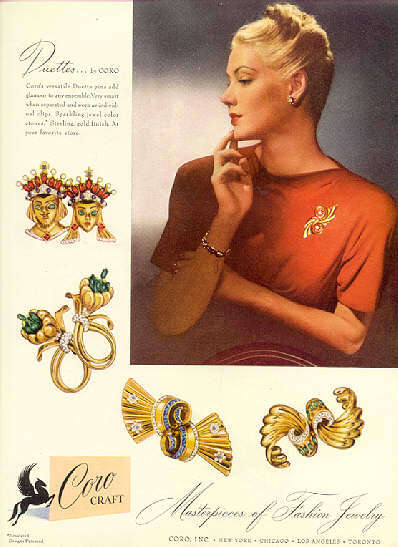 Styling of this piece is typical of the 1940s and this particular style Duette was advertised in 1945, view authentic ad here courtesy Morning Glory catalog site. Excellent vintage condition with all stones present and clear. Goldwashed finish is in very fine condition on both sides of the clip with normal vintage patina as may be expected. The Duette clip mechanism is complete and tight and all parts function as they should. In seashell motif, pavé rhinestones edge and accent, center top holds two baguettes. Cast metal with domed gold-washed fronts, rhodiumplated backs. Clips marked PAT. 1852188, a mechanism design by Elias Phinney, granted in 1932, for use on Coro duettes. No mark or signature, only this patent number. The Patent Design number is 156,529. 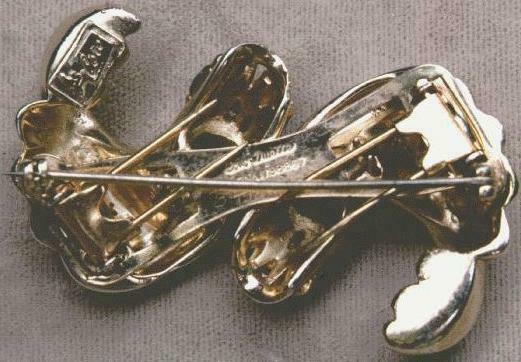 The sketch and application for these clips, dated Dec. 20, 1949, can be seen here courtesy Jewelry Patents. Condition: Goldwash has patina as may be expected. Stones are present and clear. The mechanism for holding the two clips together is not available. This is where the Coro mark usually appears. Price reflects the absence of joining mechanism. 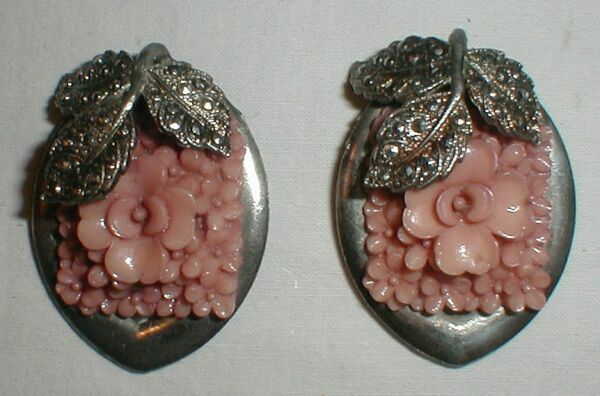 A pair of unusual dress clips in silvertone metal have a large raised pale coral color plastic flower center and smaller molded flowers surrounding. Above the flowers are super-imposed antique finish metal leaves pavé in marcasites. 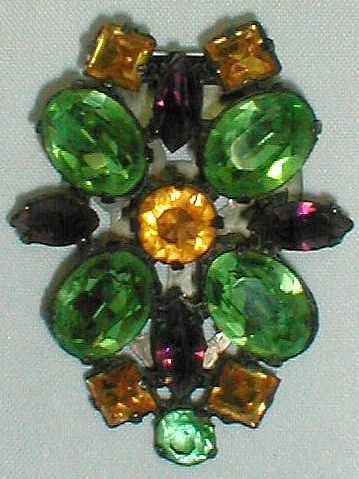 Shield style typical of the Deco era, with four oval and four navette shape facetted crystal stones in pale emerald and deep purple, accented with citrine color square stones and round center stone. Circa mid-1930s. Typical potmetal cast plated in gunmetal finish, with long scroll-decorated clip mechanism which is very tight. All stones are foiled except bottom center round green stone. 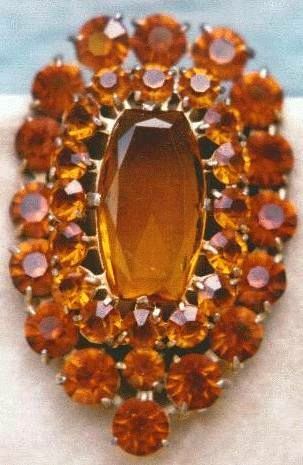 Honey topaz color unfoiled faceted prongset glass stones. 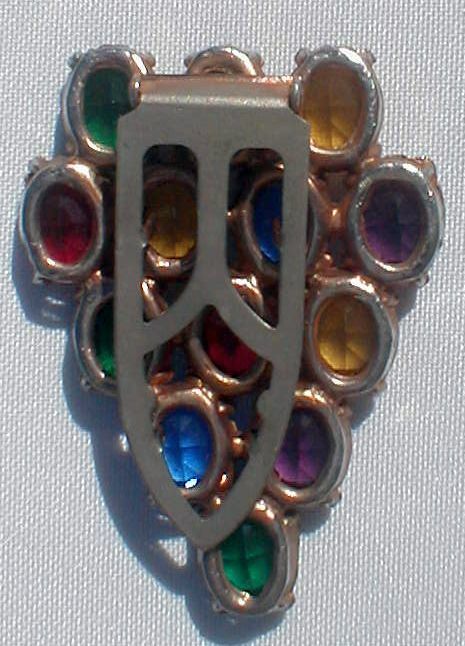 Center stone 30 mm high, goldplated cast, wide semi-oval clip mechanism. All stones present and clear, goldwash in very fine condition, clip tight. Deep emerald green faceted prongset glass stones, clear accent rhinestones. Silverplated cast, long clip mechanism. Circa 1930s. 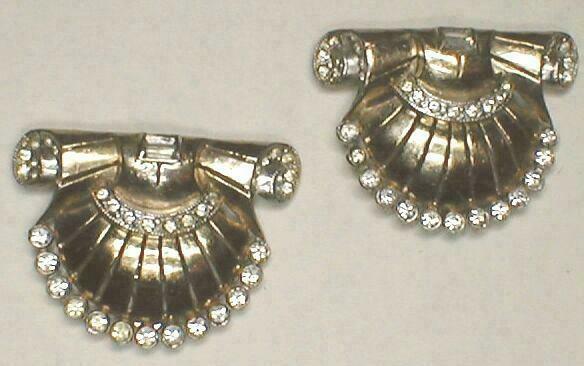 All stones present and clear, plating in very good condition, clip tight. 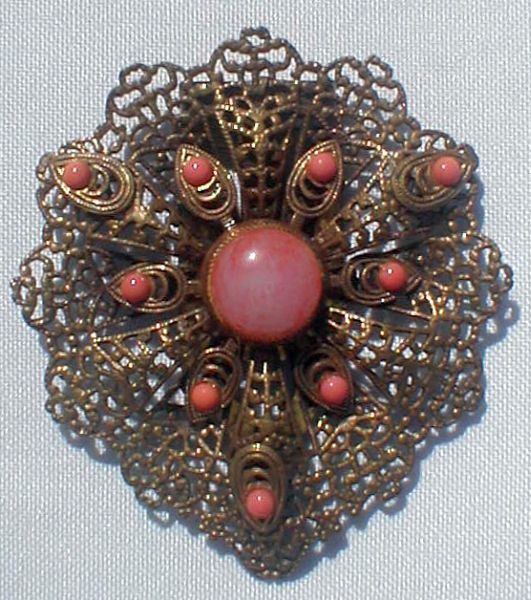 Three 1" plus long simulated pearls in antique gray tone spread from top filigree antiqued brass medallion with center red glass cabochon and six tiny simulated pearls. 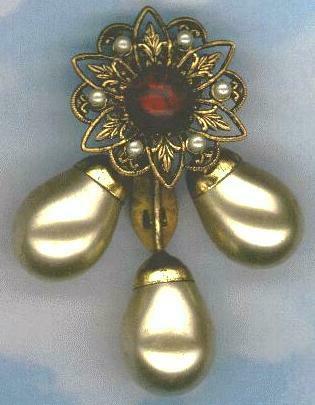 All simulated pearls are in excellent condition. 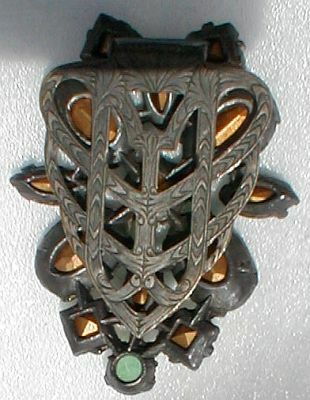 Filigree complete and in good condition, clip tight. 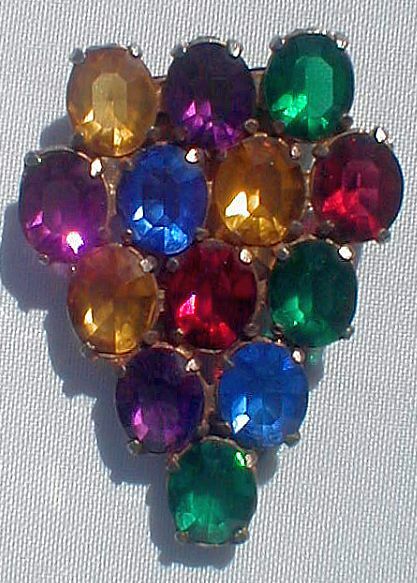 Classic V-shape shield in jewel color faceted oval crystal stones: Ruby red, sapphire blue, amethyst, emerald green and golden topaz. C:a Late 1930's. Narrow table oval stones are all pronged and unfoiled, set in goldwashed brass cups in fine vintage condition with patina. Clip mechanism is tight. 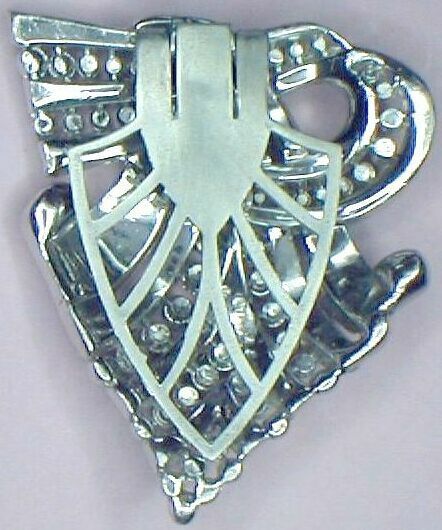 Size: 2 1/4" H x 1 5/8" W approx., stones: 12x10 mm. 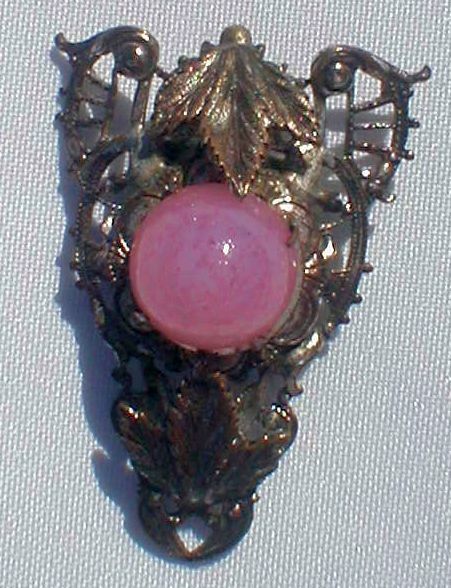 Silverplated brass fancy leaves and scrolls filigree dress clip sports high-domed glass cabochon imitating rose quartz. C:a 1940s, probably from Rhode Island. 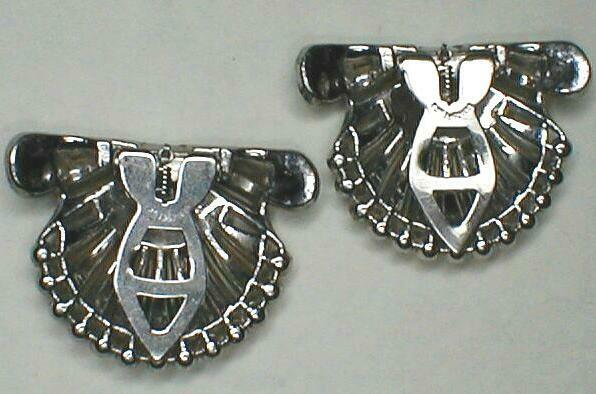 Small clip mechanism is very tight, cabochon in good condition as is metal finish. All stones present and good, metal is complete and good condition, clip tight.